I need to read and write various flash card images. The way i always did this in linux was with dd, and that did the trick. What is a good windows equivalent? Simply put, i need to be able to read an entire card into a file and vice versa. I tried WinDD, but that seems to operate on partitions rather than entire devices, but i need to be able to dump the entire disk/card and its partition table regardless of its content. Using Windows 7 64bit, with the card reader on a USB3 port. Try Win32DiskImager , it can write images to disks. Just use dd for WIndows ... it works perfectly even though it is quite an old project. Rufus works as expected. Choose 'DD Image' for 'Create bootable disk using'. The source is published on GitHub: https://github.com/pbatard/rufus. My experience: Win32DiskImager did not detect u-SD through a USB-3 reader; dd for Windows, MinGW compiled dd, Unix Utils dd, and Linux dd VIA VirtualBox VM USB3 pass-through were all unacceptably slow; I have yet to find a Windows command line equivalent that can beat the 50MB/s write speeds I'm seeing with Rufus. surprised nobody mentioned GNU core utils for Windows, I've been using them for years. they're 32-bit binaries but apparently, except for less, they still work under Windows 7 64-bits. the reported times are a bit odd but otherwise it seems to work well. First I also tried Win32DiskImager, which I thought is doing only partition copy based on its display (no, it can backup an entire SD card), so I continued searching. My current favourite is HDDRawCopy. It copies to/from file an entire disk image, but not partitions separately. It creates dd compatible or compressed images on the fly - not as efficient as 7zip (does not reach ZIP performance even) but you don't need to touch the image again. For a true equivalent of dd on Windows, don't look for half-baked alternatives — just install the real GNU dd. The best way to do this is probably Cygwin, a pretty complete distribution of GNU and other FOSS tools. Think of it as installing "Linux" (or rather, a (GNU)Linux distribution) on top of Windows, without any emulation layers or a limited black box like the Windows Subsystem for Linux. It's as native as it gets. 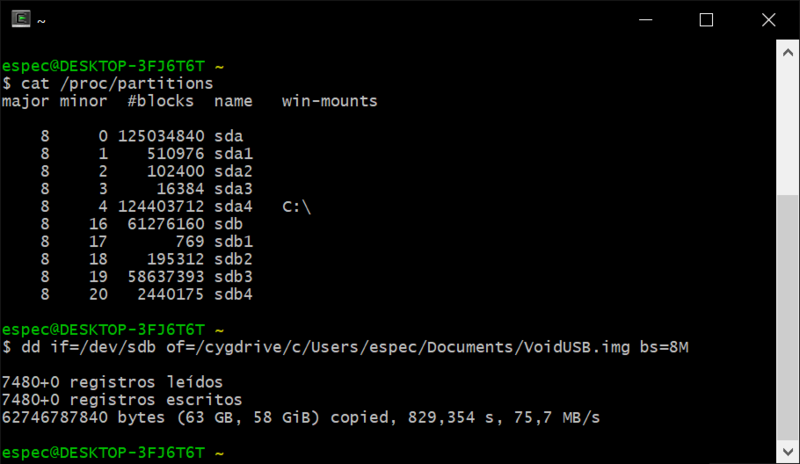 Install a basic Cygwin environment. Do so as instructed on the website, just leave the defaults if you only need dd — but you can also have some fun and get a hint on what it has to offer. Open the Cygwin terminal as administrator, then check which device/partition you want to work on with cat /proc/partitions. Use dd as you would on any (GNU)Linux. wow all those responses and DISM has been around for how long? pretty sure it was built into windows 7 from the get go. there are alot of settings you can tweak. after you capture - deploy to new storage media using the dism tools also. Not the answer you're looking for? Browse other questions tagged windows-7 windows dd disk-image or ask your own question. (How) can I get Microsoft NetMeeting to work on Windows 7 without using a virtual machine? How would I create a bootable external drive with multiple ISOs? How to make VM disk images easy to resize?